SpudmanWP wrote: I don't fault DiD for changing (ie editorializing) on the $130mil award. I have a problem with the moving of the goalposts from Block 3F to now Block 4 in order to meet "contractual specifications". Fair enough. DiD are suspect for sure. "Lockheed Martin has been awarded USD712.5 million in support of the F-35 Lightning II Technology Refresh 3 (TR3) avionics upgrade. The contract, which was awarded by the US Department of Defense (DoD) on 27 December, covers the development of advanced hardware related to the TR3 effort due to be rolled out from low-rate initial production (LRIP) Lot 15 in 2023. The TR3 upgrade is part of the Block 4 (full combat capability) follow-on modernisation programme for the F-35, also known as Continuous Capability Development and Delivery (C2D2). The wider Block 4 capability is to be rolled out in four increments (Block 4.1, 4.2, 4.3, and 4.4)…." Are there deadlines to achieve Block 4.1, Block 4.2 and Block 4.3 ? Is TR3 part of Block 4.2 upgrade ? United Technologies Corp.’s (NYSE: UTX) Pratt & Whitney subsidiary has received a five-year, $230.1M contract from the U.S. Navy to support flight testing of a new F-35 aircraft propulsion system. Pratt & Whitney will help test F-35 Block 4 engine technology for Navy, the U.S. Air Force, U.S. Marine Corps and non-Department of Defense entities, the DoD said Friday. The company will also provide spare and repair parts, technical engineering services and special tooling and equipment as part of the fixed-price-incentive-firm and cost-plus-incentive-fee contract. Both the Navy and Marine Corps will obligate a total of $20M in fiscal 2019 research, development, test and evaluation funds. Pratt & Whitney will perform contract services at the Naval Air Station Patuxent River in Maryland and facilities in California and Connecticut. The Pentagon expects contract work to finish in December 2023. TR3 is part of Block 4.2.
laos wrote: Are there deadlines to achieve Block 4.1, Block 4.2 and Block 4.3 ? if you go back to pg 7 you will find the answer posted by Spuds for the 2nd question which as usual Spuds has beaten me to. weasel1962 and SpudmanWP - thank you. the last Block 3F software was delivered in December and the first Block 4 update is planned for April 2019. Block 4 comprises some 53 improvements to counter both air- and ground-based threats emerging from China and Russia. None of these upgrades will change the aircraft’s outer appearance, or “mold line.” Instead, they are primarily new or enhanced features executed in software, which will be rolled out in stages, with updates every April and October starting in 2019 and continuing through at least 2024. “Instead of doing two-year deliveries … we decided to go to a more continuous capability framework,” said Vice Adm. Mathias W. Winter, F-35 Program Executive Officer, in a December interview. 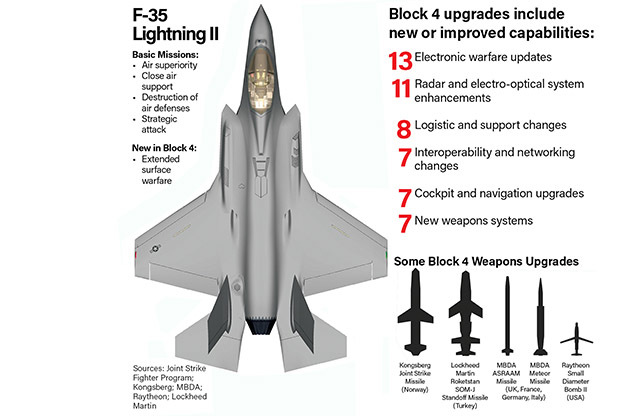 Now that Block 3F has been “verified and validated,” the Lightning II is a “mature” system, Winter said, and ready to accept “modernization, enhancement, and improvements.” Exactly how many early production F-35s will be upgraded to the 3F configuration may be revealed in the 2020 budget submission to Congress. Handled at the squadron level, TR3 upgrades can be completed “in a couple of days,” Winter said. That’s in contrast to TR2 modifications that require depot-level installation of structural and component improvements. Parting thought... The pic above shows the JSM, SOM-J, SDB2, ASRRAM, and Meteor as 5 of the new Blcok 4 weapons. Thought on the other two? Although the F-35 can carry the new Long-Range Anti-Ship Missile, or LRASM, externally, Winter said the principal new anti-ship missiles coming in Block 4 are the JSOW C1 for the Navy and the Norwegian JSM. The program has “not been asked” about whether the stealthy LRASM can fit inside the F-35’s weapon bays, he said, nor has the Navy asked to integrate the SLAM-ER (Standoff Land Attack Missile-Extended Range) version of the Harpoon anti-ship missile. Last October, then-Defense Secretary Jim Mattis directed the Air Force to increase mission capable rates for the F-22, F-16, and F-35 to at least 80 percent. At the time, the F-35 rate was 54 percent overall, but for 3F aircraft recently off the production line, the rate was better than 80 percent. Winter agreed that spare parts are the “long pole in the tent” for getting the F-35 fleet up to the 80 percent standard. “We have initiatives underway to increase spare parts production,” he said, including accelerating the rate at which parts can be repaired by the F-35 depot at Hill AFB, Utah. This will allow industry to concentrate on making more new parts, rather than fixing older ones, he said. The Air Force has until Sept. 30 to achieve the 80 percent mission capable rate, assuming the order stands under Acting Defense Secretary Patrick M. Shanahan or his successor. I wonder if "the F-35 can carry the new Long-Range Anti-Ship Missile, or LRASM, externally" means that it is one of the 2 unnamed weapons or that it's just "physically capable" of being carried externally? For the 2 other weapons: JSOW-ER (software changes would be required for an updated launch zone if UAI isn't added first) and SPEAR 3 perhaps. I can't see them ever integrating SLAM-ER, almost anything USN would use it for could be done with JSOW-C1. Keep it in the carrier's stores for the Superbugs but really not worth bothering with for F-35.